£75 for the 12 (13) weeks (that's less than £5.90 a week!). You can hire the kit for a donation of £25 too. Our next course (held Sundays between 1pm and 2.30pm) organised by HRD and supported by Dacorum Borough Council starts 9 September 2018. Book your tickets now or email recruitment@hertsrd.co.uk for more information. Are you interested in getting fit, having fun and meeting a whole new bunch of amazing people? We’re looking for new skaters aged 18 and over to join our league. 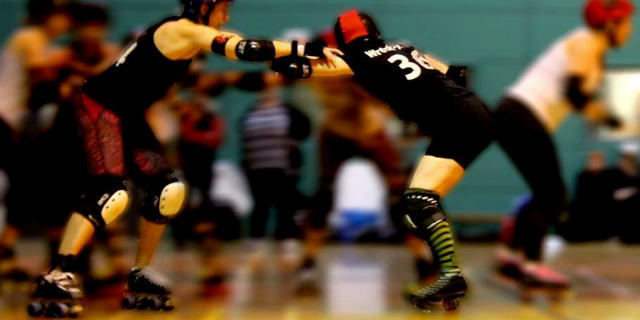 Our 13-week roller derby course will teach skating skills and the basics of roller derby. Complete beginners welcome! The course includes 12 weeks of skating and one extra week getting under the bonnet and getting involved with some of the non-skating positions to support a Hell’s Belles game lead by our Head NSO Aurora Scorer. This will be the best thing you ever do. Don't wait. Book your place today. You won't regret it for a second.